Challenge yourself to try a different fruit or veggie every day in August! The August 2018 Produce Challenge is here and it’s packed with late summer goodies and year-round favorites. 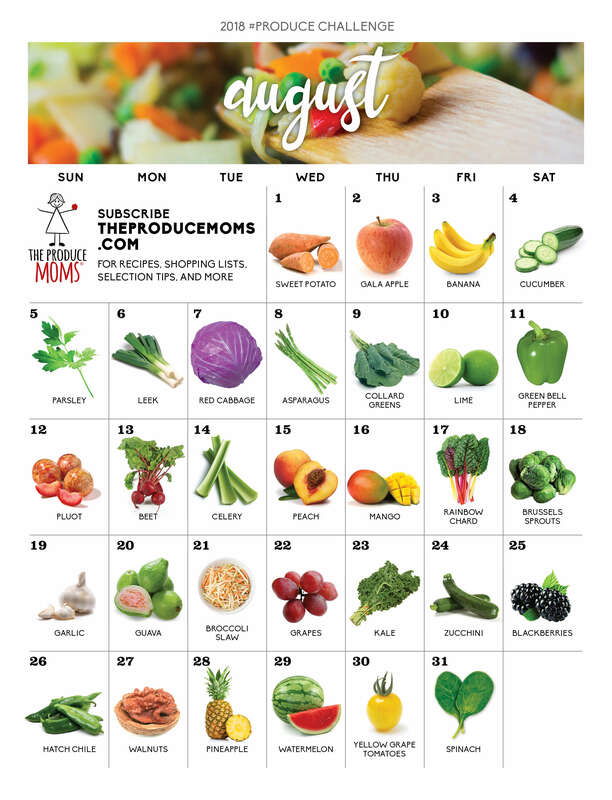 Use the Produce Challenge Calendar as your shopping guide this month and enjoy a different fruit or veggie each day. Be sure to join our weekly e-newsletter (subscribe below) to receive coordinating recipes and selection tips. It’s completely free! Subscribe to the #ProduceChallenge & make eating fruits and veggies easy! When you subscribe to the #ProduceChallenge, you’ll receive a weekly e-newsletter with delicious recipes, produce tips, cooking tutorials, and inspiration. Be on the lookout for special events and giveaways too! Let’s start by saying what the #ProduceChallenge is not. It is NOT a restrictive diet or a rigid plan that only health nuts can follow. The #ProduceChallenge is simply a guide to seasonal produce that contains fun challenges, positive encouragement, tips, tricks, recipes, and facts that’ll help you and your family eat more fruits and veggies. Who should take the #ProduceChallenge? People who want to eat more fruits and vegetables. Families that are tired of eating the same few fruits and vegetables week after week. Individuals who are looking for new and exciting way to cook & bake with fruits and vegetables. Parents who want strategies to get their children to eat more fruits and veggies. Parents who are looking for kid-friendly recipes. Individuals wanting to learn more about where their food comes from and how it grows. People who want produce tips, tricks, and fun facts. What if I’m on a special diet or have diet-restrictions? If you’re on a special diet or have diet restrictions, don’t worry! The #ProduceChallenge plays well with all diets: Gluten-free, dairy-free, vegetarian, organic, conventional, nut-free, no problem! The challenge isn’t about changing your current diet, it’s simply about adding more produce to it, whatever it is. If there’s a produce item on the calendar that you can’t eat, simply replace it with another one you can. As long as you’re eating fruits and veggies every day and trying new and different items, you’re doing it right! How does the #ProduceChallenge work? Join (it’s completely free) to receive a weekly e-newsletter that contains family-friendly recipes, produce industry insights, and tips & tutorials that make eating more fruits and veggies easy. To join, complete the short form located above. Which items on the August calendar are you most excited to try? Share in the comments below along with your favorite way to serve that item.